The Vulcan is a cold war icon; everybody's seen the old film footage of these bat-winged white shapes getting airborne with a howl of engines, pouring black smoke from their exhausts and carrying a bomb load of instant sunshine during mock scrambles. Acting as an important part of the NATO nuclear deterrent against the Warsaw Pact, the bright white futuristic shapes were soon camouflaged and retasked with low-level penetration of the vast expanses of the Soviet Union. With advances in the technology of mutually assured destruction, the Vulcan and her sisters in the V-force were soon sidelined by the nuclear submarine, but the Vulcan was kept on as a conventional bomber (while the Victors became tankers and the Valiants found life at low level too tough, and were retired). It was as a conventional bomber that the aircraft found its true and everlasting fame, flying thousands of miles to bomb a tiny runway on a tiny set of islands far down in the South Atlantic. The Black Buck missions of the Falkands War of 1982 put the aircraft firmly back in the public eye, and even though the type only lasted another two years in frontline service, the RAF kept one on purely for ceremonial and display duties - something unthinkable in this day and age of PC, petty bureaucracy and penny-pinching. We had 9 glorious years of watching a Vulcan at airshows - first XL426 until she ran out of hours, then XH558 took over in 1986. Sadly it all came to an end in 1992, with XH558's final airshow season, culminating in a tear-filled final appearances at Cranfield's Dreamflight airshow. After that it was just few currency flights every now and again while her future was decided. Finally, she was sold, to C. Walton Aircraft Ltd. at Bruntingthorpe, and was flown there in March 1993, for what many thought would be the final time. David Walton's team of volunteers kept her in running condition, and she was the star of the 'Rolling Thunder' fast taxi days held at the airfield for some years. In 1997 Robert Pleming came on the scene, and after talks with David Walton they agreed to go forward with a proposal to return the aircraft to the skies. Early agreement from BAE Systems' Heritage Committee was a huge boost to the idea and a technical survey began to see what was needed to get the aircraft back in the air. 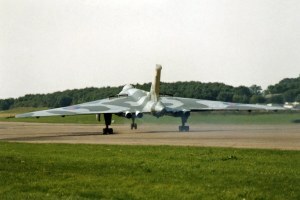 In September 1999 she carried out her last fast taxi run before retiring to the main hangar at Bruntingthorpe in preparation for the work to return her to flight and The Vulcan Operating Company was formed. A further two years down the line, the Vulcan to the Sky fund-raising campaign began, and a year after that the first application for lottery money was put in. It failed, but the Heritage Lottery Fund provided valuable advice on how to try again, and the second application in 2003 was successful. Nearly 3 million pounds was awarded in June of 2004, and was added to over a million donated by supporters of the aircraft since 2001. In 2005 the Waltons sold the aircraft to the Vulcan to the Sky Trust, and restoration work commenced. Over the last two years the aircraft has practically been rebuilt from the ground up, with over 5 miles of wiring replaced, every component inspected and repaired or replaced as necessary, any corrosion rectified, new engines installed, redundant systems removed to save weight (and therefore stress on the airframe), new and far more advanced avionics including GPS navigation kit installed... it has been a mammoth task, undertaken by a mix of personnel from Marshalls of Cambridge, the RAF, and TVOC staff. The UK's Civil Aviation Authority classes the Vulcan as a complex type, which immediately places the restoration and operation of the aircraft into a very deep and dark pit to climb out of. Regulatory and financial problems abound, but two very important factors enabled the TVOC team to climb out where so many others have failed - first of all, the Vulcan had a superb safety record while in RAF service. Had this not been the case, there would have been no way the CAA would have permitted it to fly. Secondly, it has unrivalled support from the public - not just aircraft enthusiasts, but hundreds of thousands of 'Joe Public'. This meant the donations flowed in at a rate sufficient - if only just so - to keep the project going. Crisis was never far away in such an expensive and complex project, and with so many components sent out to their original manufacturers for work to be done on them, predicting costs was always going to be fraught with difficulties. In April 2006 the crunch point was reached, with several cost overruns threatening to scupper the project, and the money was predicted to run out by the end of August. A cool million pounds had to be raised between April and August to keep the project alive... and, incredibly, they did it. With just days to spare, the target amount was reached with the aid of a massive donation of £500,000 from Sir Jack Hayward (best known as owner of Wolverhampton Wanderers football club, but he also served in the RAF in WWII). Amid much ceremony and overflights by the BBMF Lancaster, XH558 was 'rolled out' in front of an appreciative crowd to celebrate the successful acquisition of enough funds to get her as far as the first test flight. From schoolboys' pocket money to the hefty donation of a millionaire, this was an aircraft restoration funded unlike any other. Unfortunately work was slower than expected, and she missed her starring role in the Falklands Flypast over London in June 2007, and it was not until September that she began engine running trials, bringing a roaring Olympus back to life at Bruntingthorpe for the first time in 8 years. Amidst much excitement a date for the first flight was set... but then postponed as snags of various types reared their ugly heads. At the most inopportune moment, for instance, a hydraulic pipe burst above the number 3 engine, just when almost everything else was ready. Dropping the engine out to fix the pipe and putting the engine back in was accomplished in almost no time at all, and then it was time for taxi trials to begin. Slow runs first were followed by the excitement of faster and noisier runs, with the heart-stopping sight of the nosewheels rising gracefully from the runway in a 'reach for the sky' pose. Another run tested the huge braking parachute, which unfurled perfectly and ticked the final box... it was time to fly. So it was on a foggy morning that various media and VIPs arrived at Bruntingthorpe while the roads outside became ever more clogged by Vulcan fans who had heard about the first flight date from friends, from local radio, from forums on the internet... it was the 18th of October, the sky was blue, and the last tendrils of mist were dissipating from a cold and damp field in the middle of Leicestershire. I don't think I've ever been to an occasion quite like it. With no general announcements being made of what was going on, the time given for the aircraft being towed out of the hangar came and went, but even the usually vocal 'big media' of TV and national newspapers were failing to complain. As the cold percolated up through our feet, the atmosphere was not one of impatience but of simple hope that this incredible day was really going to go ahead. Just over half an hour late, the tug was finally attached and XH558 began inching out from her hangar, wings sweeping over the assembled media and then it was time for a rush down to the designated viewing area around two-thirds of the way along the massive runway at Bruntingthorpe. Built in 1941/1942, Bruntingthorpe was originally in use by the Wellingtons of Bomber Command, though as an Operational Training Unit rather than a frontline unit. After the war it became a USAF station and the main runway was extended for jet types such as the B-47 and RB-66. Closed in 1962, the site was bought by the Waltons in 1972 and turned into a high-performance test track and storage facility for motor vehicles. Many of the dispersals and much of the perimeter track survive, along with the entire length of the runway, mostly used these days as a track for testing and racing. Sadly for the Vulcan fans gathered outside, the airfield has been surrounded by dense trees and earth banking to protect the local villages from the worst of the track noise, and this made viewing the take-off from outside impossible, and even the engine start and taxiing were inaudible from many spots outside the airfield. Regular SMS text message updates were sent by those on the airfield to those outside, while anticipation mounted. Finally just over an hour after originally planned, XH558 sedately taxied out from her engine starting pan, and proceeded past the assembled VIPs and media to take to the runway. Al McDicken and David Thomas were in the pilots' seats; Barry Masefield in the AEO's position in the rear cockpit. Back tracking to the Bruntingthorpe village end of the runway, she turned around and then rested for a moment, while hearts pounded and countless prayers for a safe flight were muttered. The engine note rose, and rose... and rose. She suddenly darted forward and the famous Vulcan howl echoed around the airfield (imagine a dinosaur roaring in anger at the sudden appearance of a chap in a Victorian time machine). Rotate - and she was off in no time at all, flashing past us, searing her way into the blazing blue and roaring into her true place, above our heads as well as in our hearts. Instead of the sedate couple of circuits of the airfield we'd expected, she turned left and made her way out over the former Vulcan base of RAF Cottesmore and on to do some handling trials over the fenlands of Cambridgeshire before returning around half an hour later for a flypast and then to come in for the smoothest landing any jet aircraft has ever performed while the crowd clapped and cheered their approval and the culmination of so many hopes and dreams. This was just step 1 in the test programme, and money was still needed - but on that day she was her own advert, flying far enough away from Bruntingthorpe to be seen by many unable to make it there, or unaware that this was the day. I received delighted text messages from friends, who'd seen it from places as far away as Sywell and Kings Cliffe in Northamptonshire, and could barely believe their eyes. With this much delight and support for her return to the air, she was a dead cert at airshows, guaranteeing thousands of extra people through the gate (indeed a rumour she'd be doing a flypast at the last Duxford show of the season saw queues extending a couple of miles away from the airfield at a time when normally everybody would have been already parked up!). 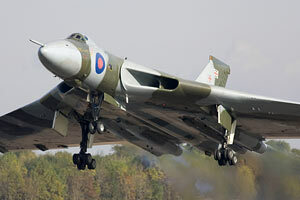 Six more test flights followed in early 2008, with XH558 flying to RAF Cottesmore on 14th April, followed by a return to Bruntingthorpe on 16th April (a shorter flight, as one of the main gear doors refused to retract). These were followed by a flight to RAF Coningsby (for a compass swing) on 6th May and a return to Bruntingthorpe on 9th May. The test programme was completed with a further flight on 9th June (which included some display practice), and a few radio snags were then sorted before another short flight on 23rd June (another flight including some display practice). Sadly to date a single big sponsor has not come on board for this magnificent project - funding to complete the flight test programme has come from more than £250,000 raised entirely from public donations and they still need to raise £50,000 a month after that. A very generous bit of sponsorship from Aerobytes Ltd. means that the first three big airshow appearances were funded but the public's donations continued to be needed just as badly as before - and indeed, they are still the major funding behind the aircraft to this day. On 3rd July 2008, the paperwork finally came through and Vulcan XH558 gained her Permit to Fly - becoming the most complex ex-military type to ever be operated in civilian hands. She promptly flew to RAF Waddington and carried out several practice displays enabling her captain for the day - Dave Thomas - to gain his Display Authorisation in time to carry out her first public display at that weekend's airshow. Her next appearance was to be at RIAT at Fairford but that show was cancelled due to poor weather ruining the car parks, and so her next appearance was at Farnborough (four displays, bringing the place to a standstill) followed by Lowestoft (two displays), RAF Marham and RAF Cottesmore (both families day displays) and also RAF Wyton (flypast). She went on to carry out several more displays before returning to Bruntingthorpe in November. Funding once again reached a critical stage in late 2008, but a successful pledge campaign raised enough money to get the aircraft onto the airshow circuit once again in 2009. The year began very well with displays at RAF Brize Norton Families Day and the RAF Cosford Airshow, followed by a trip to Holland and two displays at Volkel, returning to the UK to display at Kemble, a flypast or two at Wellesbourne over sister aircraft XM655 and then a display at the Biggin Hill airshow before bad luck intervened again and an artificial feel unit failed, cancelling her second day at Biggin. Her next show appearance was to be at the RAF Waddington airshow, and while she transited successfully, carrying out a practice display on arrival, this was on the last day of her Permit to Fly (these are renewed annually). One of the conditions the CAA placed on the issue of the Permit in July 2008 was that some deep structural inspections would be carried out; these would be extremely difficult to carry out on XH558, as they would practically destroy parts of the airframe in the dismantling process to get at the areas that the CAA want inspected. An agreement was made to make these inspections on a similar aircraft and use these results; XM603 at Woodford was chosen to be the victim, as she was due to be scrapped anyway. Unfortunately these inspections were repeatedly deferred (and XM603 has not been scrapped!) and to surprise all round the CAA refused to renew XH558's Permit to Fly, when they had been expected to grant another inspection deferral. A week later a three month extension to her Permit was granted and she flew to Yeovilton for the annual Air Day - however weather precluded her flying at the show itself. She was the undoubted star of the show at RIAT, with a particularly stunning take-off on Sunday. A succession of shows after that included Lowestoft, East Fortune, Sunderland, Windermere, Whitehaven, Dawlish (in formation with the Red Arrows) and Dunsfold before she retired for the winter to RAF Lyneham. The winter of 2009 was a hard one, with the project nearly coming to an end due to lack of funding but once again the public donated in their thousands and together with some large donations from corporate sponsors such as Aerobytes - and one big anonymous donor - enough money was raised to begin some much-needed work on the aircraft to extend her life. XH558 returned to the air just in time for the 2010 Waddington Airshow, and has been regularly flying ever since - missing just one flight in 2010 for unserviceability due to a faulty brake unit. Unfortunately the British weather was as reliable as ever, and this kept the aircraft on the ground for several of its scheduled appearances. Fund raising was more successful in 2010, but there was still a big funding gap by the end of the season - happily Aerobytes and the public once again put their hands in their pockets and with much volunteer help, Vulcan To The Sky's employees kept their jobs and the aircraft continued to fly through 2011. By May 2012 funding had once again become critical with efforts continuing to raise enough money to keep the company in business and the aircraft flying. A further blow to their chances arrived in the shape of a double engine failure caused by FOD ingestion at the beginning of a take-off roll. While the aircraft successfully aborted the take-off with no injuries to crew and reportedly no damage to the aircraft, both of the affected engines were scrap. They did have two spare engines, but that pretty much exhausted their remaining stock. Of course by now, late 2016, we know that VTST overcame all their funding problems to keep XH558 airborne until the end of 2015, when support from BAE, Rolls Royce and Marshalls came to an end along - apparently - with the CAA's appetite for the operation of jet engined ex-military jets in the UK after the Shoreham Airshow disaster. XH558 spent much of October 2015 making her last public appearances, culminating in a final - private - display at the small aerodrome at Sywell in Northamptonshire on 13th October 2015. After that she flew just one more time, for a handful of minutes, on 28th October - with VTST having kept the occasion entirely secret from the hundreds of thousands of people who had funded her restoration and operation. A sad end - but oh the joy we had watching that great beast fly for 8 years that we had no right to expect at all! With thanks to Kevin 'Taff' Stone and crew, Dave Thomas, Martin Withers, Mike Pollitt, Andrew Edmondson, Peter Holloway, Paul Muckle, Denis Parker, Rusty Drewett, Colin Marshall, Alan Rolfe, Richard Clarke, RNAS Yeovilton Met Office and 'Sonic', RAF Brize Norton ATC, RAF Cottesmore VASS/MCO, RAF Waddington VAHS and the RIAT Photo Team for their hospitality and assistance.